Brian Robbins is a 27-year chiropractor, author, real estate investor, the owner of multiple companies, and the father of 10 children. He’s not only making a great income, but he’s also found a way to create sustainable passive income as well. This shift is crucial to doing it all and doing it well! We’ll learn from his mental model and way of thinking that allowed him to accomplish so much. Gleaning from his journey and lessons along the way, you’ll recognize ways to expand your own capabilities and live out your best life. 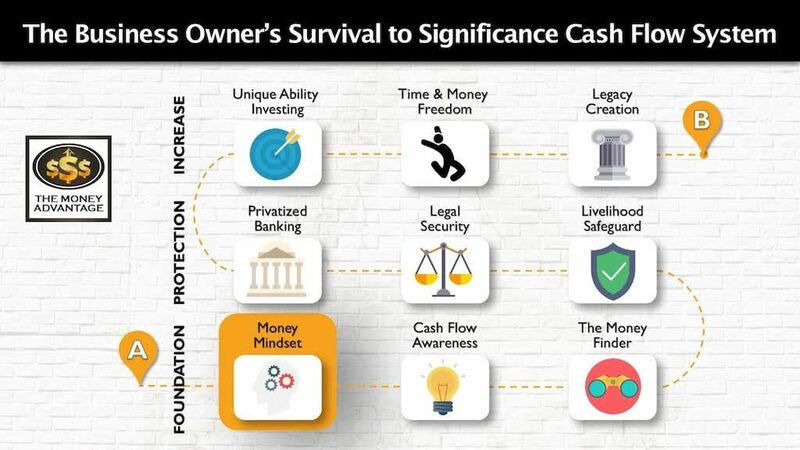 Here at The Money Advantage, we are a community of wealth creators. We’re entrepreneurially-minded business owners who are taking control of our lives and financial destiny. It’s not enough to just make a great income. You have to figure out how to keep more, protect that money, and finally, increase and make more through the right investing decisions. That’s why we’ve put together a 3-step roadmap to help business owners create time and money freedom. This conversation will help you take an honest look at your mindset and add better thinking patterns or delete old ones that aren’t helping you build the life you love today. Before entering the multifamily investment arena, Dr. Robbins owned several companies including multiple medical practices, a coffee shop, a 1,500-member gym, and real estate investments. These real estate investments included a small apartment complex, a 32,000 square foot retail shopping center which houses his medical practice, and several single-family properties. Dr. Brian Robbins is the author of Done! The Professional’s Guide to Double-Digit Returns, Multi-Generational Wealth, and a Worry-Free Retirement (2017). Dr. Robbins, business partner of Paul Moore, is now fully committed to helping others reach their financial goals using the Wellings Capital multifamily wealth generation platform. He and his wife Anita live on a farm in Central Virginia where they have raised 10 children, including 8 that were adopted. [3:49 Brian Robbins] I’m a chiropractor by trade. When I graduated from medical school, I always wanted to have a multi-discipline practice. I was an entrepreneur as far back as I can remember. My mom would get mad because I would go out on my bike, jump into dumpsters, and dig around looking for aluminum cans to throw into a big bag, because I could recycle those and make four bucks. I sold Postcards from door to door, and did a bit of everything as a kid, just trying to make a little bit of money here and there. I was born as an entrepreneur. But after medical school, just looking at options that were out there, I had that in my mind the whole time. Then I did the standard type of practice for several years until we were fortunate enough to adopt some children. And we adopted a sibling group of seven Russian orphans about 20 years ago. [5:08 Brian Robbins] We had two biological kids at the time. My wife was unable to get pregnant past those first two children. So, we looked at different options, and just really didn’t want to go down the whole road of trying to work with clinics that specialize in helping you conceive. We decided that we would look at adopting. This particular group of kids came across our path. We found out that the Russian government was in the process of getting ready to separate them and send them to three different countries, and they would never see each other. Their ages ranged from 5 – 14 at the time. We were fortunate enough to be able to keep them together and bring them into our home. That was the catalyst that really pushed me forward on my entrepreneurial journey for sure. [6:26 Brian Robbins] Initially, it was just, can we survive this? To be honest, we never intended to adopt seven children. In fact, when my wife heard about the plight of these kids, she just set out to find a home for them. She talked to all our friends that were wealthy, had farms or ways to support a group that large. We actually laughed about the idea of taking that many kids into our home. But the more she tried to sell other folks on it, the more she sold us on it. So, we just decided we can make this work, even if we have to eat beans and rice. So, we did that. And we definitely ate beans and rice initially. Then the reality set in, and all the bills started to mount, seven to nine sets of braces, college, and weddings. Just thinking about all that sparked that desire to create some passive income. I only had so many hours in a day, I could only treat so many patients. But I needed to do something besides just the labor I personally performed. You’ve probably heard the term “wage slave.” That’s what I was at the time. That’s what planted the seeds for us to look at other opportunities. [8:29 Brian Robbins] I started looking around at options to earn passive income. I had some friends that had multiple clinics. So, we decided to do work on some other clinics. Some of them went very well, and others were average. They all told me, it’s easy, you’ll be able to do this, and you can maybe move out of patient care and just be a manager. At the point we had four or five clinics, we found out that it was anything but passive. It was a headache for sure. I became the back-office guy, doing HR all day long. Living in a rural area, it’s difficult to find medical staffing. I went from working 45 – 50 hours per week to working about 90. With having that many kids, that wasn’t the lifestyle that we had envisioned, so we eventually just sold those off and stepped away from that. Because we were doing rehab in our clinics, a lot of the patients really enjoyed the fact that they were feeling better, but they didn’t necessarily want to go into a gym setting. So, we allowed some of our rehab patients to start working out in our rehab facility for a few dollars a month. Then that went from 15 or 20 to about 100. Then, we outgrew that, so we started a gym which ended up being Danville Athletic Club, cresting at about 1500 members. I thought, all these guys I know that own gyms are all big guys, and they’re always smiling and just having a good time. And what I actually found is that, if you don’t work out in the gym, you don’t get big. That’s number one. Number two, you can’t work out there anymore. Because every time you go to work out, everybody wants to talk to you. It’s like being a politician. Everybody’s paying $35 a month, and they want a piece of you. I very quickly found out that was not passive income, even though it was successful. We were eventually able to sell it. At one point, I had over 50 employees, because we had a small deli inside the gym, the medical clinic, and the gym. That was certainly not passive income. [12:04 Brian Robbins] It was right after the crash of the stock market. I came into a treatment room, and a man was sitting on the table, weeping. He had been working in the local Goodyear plant for 30 years. I thought that he must be in a lot of pain. Then I quickly realized that he wasn’t upset about his back pain, but about what had just happened to his retirement. He had previously invested almost everything he had in the stock market. He had rolled over from company stock into managing it himself, and then the market crashed 40 or 50%. There was nothing I could do to console him. I didn’t have words. We’re trained to handle back and neck problems, but not this. It was a defining moment that really caught my attention. I felt terrible for him, and I didn’t have an answer. It made me decide that I didn’t want to be that guy. That’s what pushed me towards real estate. [13:50 Brian Robbins] Initially, it was all just funded out of our business. We started off on a small scale, worked hard, did a lot of the labor, and never quit my primary occupation. Today, the kids call it a side hustle, but back in the day, we just called it work. We were doing something besides our primary thing. I wanted to have a hobby that produced income. I didn’t really have a choice with having that many kids. As we worked these other businesses, slowly but surely, we built each one. Then we’d sell one, get some cash, and roll that over. We started with a couple of small houses and did some rehab. That’s what got us to the point where we were able to buy a 32,000 square foot retail strip center that we were able to lease out to other companies. We have our office there. That’s how we moved into the commercial space. Unfortunately, our town is a bit economically depressed, so it wasn’t quite the smashing success that we had hoped it would be. But that laid the groundwork for us to start thinking about, and then eventually turning our attention towards multifamily property. [17:41 Brian Robbins] First of all, there are lots of resources out there. We initially got involved with a mentorship program, a group out of Richmond, Virginia called 37th Parallel. We got a lot of our training through them. It was almost like getting a master’s degree in multifamily properties. The easiest way is BiggerPockets.com, a phenomenal collection of people doing just about anything you can think of in real estate, with over 1 million subscribers. Be careful about some of the mentorship programs. You’ll pay for a weekend course, and they say they’re going to do all these things for you. A lot of times, those courses end up being just a three-day conversion for their bigger course. 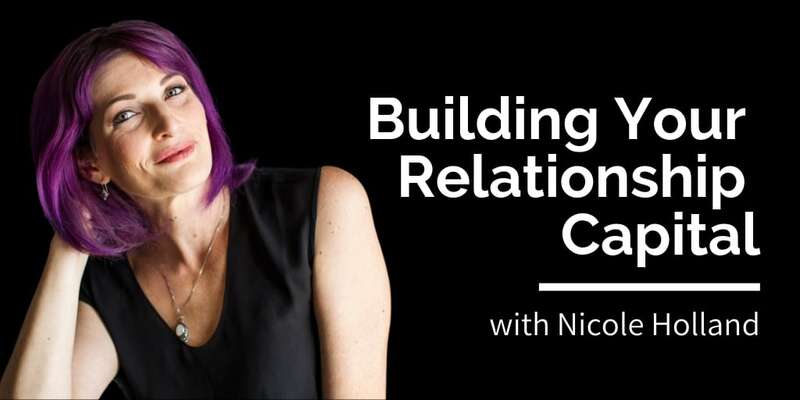 Finding a true mentorship relationship makes sense. Also, there are lots of books out there, including my book, Done! The Professional’s Guide to Double-Digit Returns, Multi-Generational Wealth and a Worry-Free Retirement. I wrote it primarily for professionals who are highly paid, but still wage slaves, hoping to guide their retirement process outside of the stock market. I tell my story, and then I also talk about the different ways to do multifamily investing so that it truly is passive. There are many ways to educate yourself before you take the leap off the off the dock. You definitely want to make sure that you don’t just quit your job one day and say, I’m going to start this. You want to make sure that the boat is there to step on to and that you’ve created some income in addition to your regular job. The two biggest mistakes I see people make is thinking that it’s going to be easy and that passive income is going to come right away, and they jump too quickly from their regular income source. 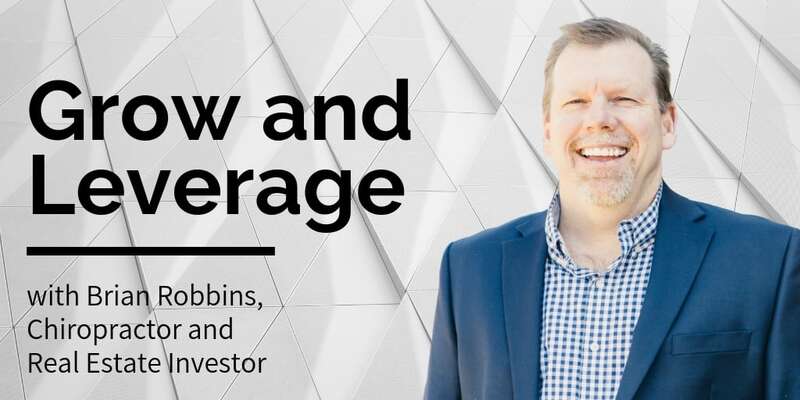 [21:39 Brian Robbins] With Wellings Capital, we’ve done syndication projects with multifamily properties and self-storage. I am still a practicing chiropractor. I really don’t feel comfortable enough getting out of the boat yet, so I haven’t given that up. It won’t be that long in the future, but we will. I’m in the process of developing another company and working towards another book as well. The market in multifamily has gotten really tight. There’s 1031 money, foreign money, institutional money, and REIT’s chasing deals, so there’s a lot of competition. We’ve recently begun to look at the self-storage industry. About 65 to 75% of self-storage is still owned by mom and pop operators. I think it’s a less consolidated industry. I’m in the process of shifting that direction and watching the market cycles in that sector. We’re planning syndication type deals for the foreseeable future as I move away from medicine eventually, but at least for the short run, I’m a little bit concerned about where we’re at in the market cycle, and not making any big steps right now, with the possibility of a downturn coming. 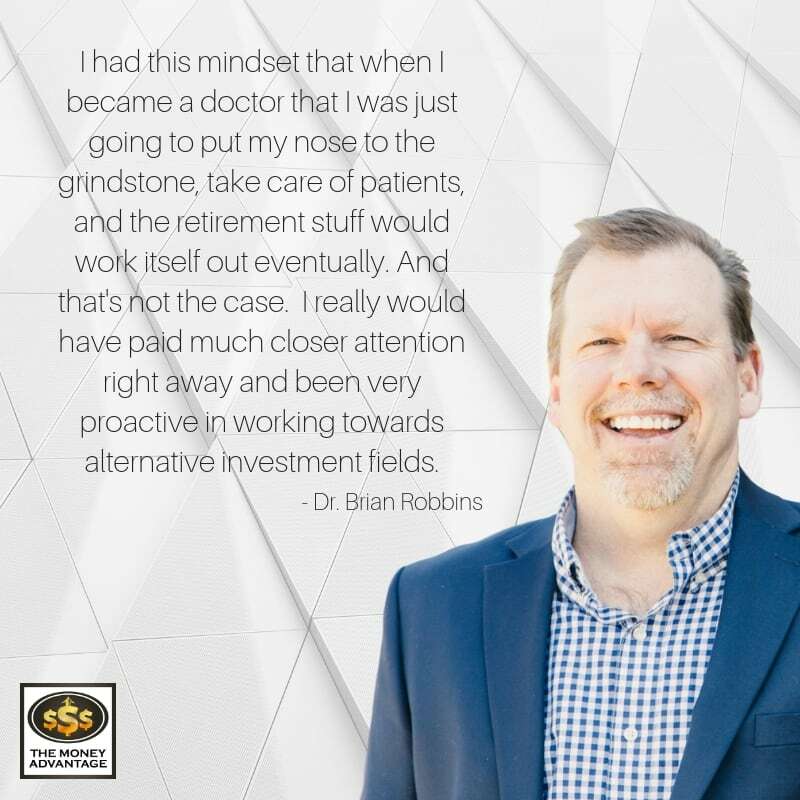 [23:43 Brian Robbins] I had this mindset that when I became a doctor that I was just going to put my nose to the grindstone, take care of patients, and the retirement stuff would work itself out eventually. And that’s not the case. I really would have paid much closer attention right away and been very proactive in working towards alternative investment fields. Personally, I’m not a high-risk guy. I don’t like the stock market as much I love assets you can drive to, touch, feel, and see. If the market would take a downturn today, our apartments would still be there, and people would still need to live. They might not be worth quite the same value, but they won’t be just a piece of paper that just says stock certificate. So, number one, I would pay attention much sooner in my career. [24:36 Brian Robbins] Number two, when I bought my strip center, I relied very heavily on the advice of a professional. I had a CPA that I thought I was very good friends with. As it turned out, he was better friends with the person that was selling the building. Looking back now, the advice I received was very self-serving to his other client and to himself. There is nobody who is going to take as good of care of you, your finances, and your family, as you are. Nobody. Even if they are a trusted friend. In my book, I quote a study that was done by one of the big investment firms, touting the fact that physicians, attorneys, and busy professionals were easy targets. I think it’s critically important that we take the time to become a good professional, anda good expert in the asset class we’re going into. You’ll have the ability to evaluate the deal on its own on its own merits, without somebody else’s input. I recommend getting other people’s input, but I wouldn’t just take one or two, I would get four, five or six. And then I would have enough background information for that asset class to make the decision myself. And always, if you’re going to invest passively with a syndicator or sponsor, you want to make sure you do your due diligence on them as well. Make sure that you’re comfortable with them, that they’ve got a track record, that you can go and visit their properties, and get the right kind of references. [31:04 Brian Robbins] With multifamily properties, part of the attractiveness is the way the tax code treats them. It allows you to do an accelerated depreciation schedule, where you can write off a lot of the costs so that you don’t have to pay a lot of taxes. In about seven to eight years, you can burn off most of your incentives. With many of these investments, you won’t have any tax gain, or very little taxes to pay in those first seven or eight years. If you then turn that property and sell it, the tax code also allows for something called a 1031 exchange. You can take the money that was produced from that property and buy another property. Then the clock starts over, as far as the taxes and depreciation on the new property are concerned. If you start off in a duplex or a single-family home, and you just keep growing larger and larger, theoretically you’ll never have any taxes to pay until you die. And then kids can have a have a stepped-up basis, so they started a whole new level. You’re able to pass this wealth on without having to pay the significant amounts of taxes that you might have to in other types of asset classes. The government puts tax incentives where they want investors to invest. They want these properties to be improved, to make it a better place to live, to take care of the tenants that are there, and then to be able to pass it on. That’s really what the tax code is encouraging here. So that’s primarily what I cover in my book. How Do You Enjoy Your Life and Business in the Process of Building It? [38:37 Brian Robbins] I share everything that I do with my wife. We do a lot of this together, and really enjoy the entrepreneurial game. We love looking at a property that needs work and having the vision for what it’s going to look like and what it will be able to generate afterward. It’s like finding an old car in a barn and being able to see what that car will look like when it’s completely restored. For me, it’s like solving a mystery, putting pieces of a puzzle together. That part is fulfilling, in and of itself. I don’t really envision the normal “retirement.” I think I would go crazy if I were sitting on the porch rocking with nothing to do. I will have businesses that I will be continuing to work on, I just won’t be doing the same things where I’m providing the actual labor. As I’m heading towards those retirement years, I want to set up those businesses that I can help manage that don’t take physical labor on my part, but a little mental labor. I’ve seen patients that retired and didn’t have anything to challenge them after retirement, and they seem unfulfilled. I know that studies have shown that the more things we do with our brain to challenge it as we age, the better our brain will do. My motivation is a combination of wanting to be fulfilled and stimulating my brain. I want to be as healthy as possible, so that I can have years into my 70s and 80s that are successful and productive. [41:18 Brian Robbins] Neuroplasticity is a recently-developed term. Society, in general, used to think that you could go to a certain point with your development, brain function, and intelligence level, and then that was it. What researchers have found is that the brain is very moldable and expandable. And neuroplasticity describes how you can change your intelligence level and your skill sets up into your 70s, 80s, and 90s. The whole concept of, I hit 62, I think I’m just going to stop living …that’s an old concept now. I mean, if an old chiropractor can do this, I know your listeners can. Get Dr. Brian Robbins’ book of Done! 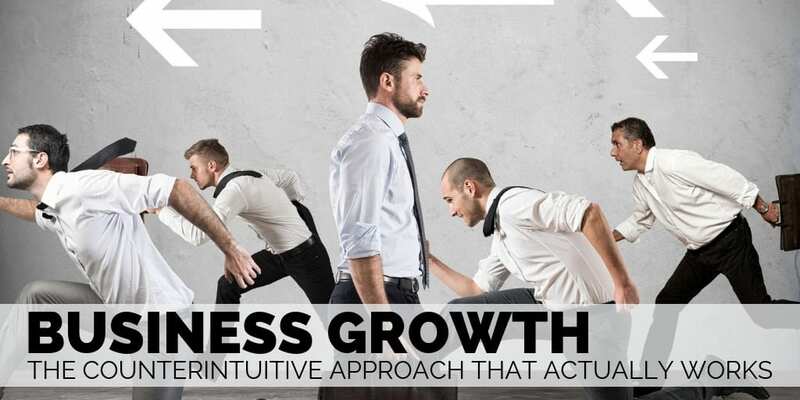 The Professional’s Guide to Double-Digit Returns, Multi-Generational Wealth, and a Worry-Free Retirement, orconnect with him directly at brian@wellingscapital.com. Do you want to begin building capital, putting it to work, and accelerating Time and Money Freedom? To find out the one thing you should be doing to increase your cash flow by keeping more of the money you make, contact us today.